Antalya, a tourism paradise visited by millions of tourists every year, is not just about sea, sand and sun. Loved for its nature, historical monuments, plateaus and diving areas, the city has also made a name for itself with its flower production. 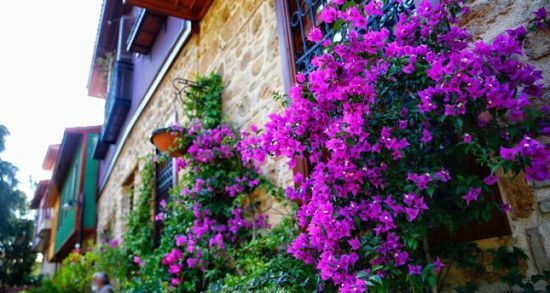 Antalya, whose streets are decorated with orange flowers, and the Taurus Mountains with peonies in the spring, is at the forefront of ornamental plant exports. Chosen as the "Golden City of Five Flowers" in the Communities in Bloom contest in Canada, Antalya has also become the pioneering city for Turkey's cut flower exports. Cut flowers are exported to 36 countries, including the Netherlands, U.K., Germany and Romania, especially from Antalya, which has great endemic plant diversity. Osman Bağdatlıoğlu, chairman of the Central Anatolian Ornamental Plants and Products Exporters' Association (OAIB), told Anadolu Agency (AA) that the ornamental plants sector is both indoor and outdoor plants and cut flowers. Bağdatlıoğlu pointed out that the main center for the cut flowers in the country is Antalya. Noting that ornamental plants are not only grown in pots at home on balconies, Bağdatlıoğlu said: "Ninety-five percent of Turkey's cut flower exports are provided from Antalya. We have reached the position to sell goods to supermarkets in Europe and other countries around the world. Now Antalya is the first city that comes to mind regarding cut flowers." Bağdatlıoğlu said that Antalya, in which flower production is done on thousands of acres, has become Turkey's city in bloom, adding that the city is in fifth in outdoor plant production and first in cut flowers. "From Antalya, which reached $35 million in ornamental plant exports last year, $25.5 million worth of flowers of different species, including roses, carnations, chrysanthemums, lilies, wedding flowers and gerbera, were exported," Bağdatlıoğlu said, suggesting that about 500 endemic plants in Antalya should be rehabilitated and exported. Professor İbrahim Yıldız from Akdeniz University's Faculty of Agriculture said that ornamental plants used for decoration centuries ago are now used as agricultural products. Explaining that ornamental plants in Turkey consist of cut flowers, potted plants, outdoor ornamental plants and natural bulbs, Yıldız said that Antalya is of great importance in terms of cut flowers and ornamental plants. Flower producer Yasemin Bayram said that she cares for the flowers, which have provided for her family for 20 years, like babies, explaining that she cares for them, cuts and processes them carefully. "Every day we cut flowers of different colors. They all give a different happiness," she added. Deniz Soydan, who makes bouquets for export, said that she has made bouquets in different colors and models ready for sale, noting that even though it is a tiring job, touching flowers is a different feeling. Hediye Çetin added that spending time with flowers gives her peace, and she occasionally makes bouquets for her husband, as well.